Dmitri Millard’s Red Chevy features a 6.6 liter World Record Duramax Diesel engine with a concrete filled block from industrial injection, BRODIX heads, industrial injection pumps and injectors, HSP big single turbo kit with a 87mm Garrett GTX 4718r Turbo and a fully built Suncoast transmission. He added 2 a ton of Nitrous for this pull. This World Record Duramax features lots of parts from pacific Performance engineering, dual Fuelers, fass fuel on the lift pumps, alligator diesel performance, Corillo sponsored rods, pistons and bearings etc. This time they were at the Northern Utah diesel specialist event in Richmond Utah. They had just made it to the event last minute as they were getting ready to pack it up. Wired up the nitrous at the last second on the dyno as they were strapping the truck in. Dimitri hadn’t slept in 2 days trying to get the truck ready testing the new single kit. He told everyone to stand back as he was about to let it all hang out to attempt to beat the previous record of 1451hp and that’s exactly what happened. The truck came up on boost, was making about 1300hp just before it hit the big stage of nitrous with two 80 pills split, it came up hard and fast until world war 3 happened under the hood. The turbo wheel was shot out the front of the truck as shrapnel was flying all over, people were running, hiding, screaming. It was nuts. This was by far the biggest explosion in diesel dyno history but he beat the record making 1614 Horsepower! For more Viral Videos check out the Busted Knuckle Video Youtube Channel. 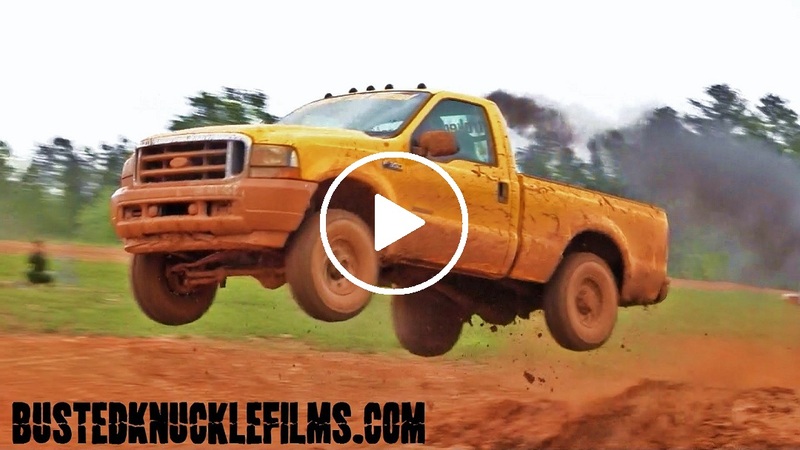 Watch this Ford Powerstroke Truck take a Beatdown in the Mud!